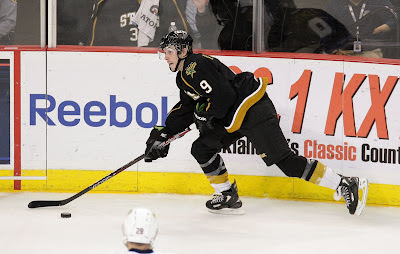 Season Recap: Who was the Texas Stars MVP? As the season is now clearly in the rear view, I wanted to take a little bit of time and recap some of the awards we've done here over the past few seasons, starting with who the Stars MVP was this season. I'll present the case for the top contenders and let you all fight it out in the comments, on Twitter and on Facebook. I've previously laid out the case that this was a career year for Colton Sceviour. His numbers speak for themselves. Playing in all but one of the Stars' games this season, Sceviour potted career highs in goals (21), assists (32) and points (53). He was one of the better players on the team at minus-8 and was constantly slotted on the top line, playing against the best the West had to offer this season (which was a lot). Most remarkable among those stats was the impact of the tallies. His six game-winning goals amounted for almost 20% of the wins Texas got on the year period. He's money in the shootout, going 2/4 on the season, and scored on a penalty shot as well in the year. Sceviour has become a true all-situations type player, something every player projected as an NHL third-liner should strive for. Additionally impressive to me this season was Sceviour's role as a veteran. We've previously discussed his role in bringing along the development of Scott Glennie while teamed up with Francis Wathier. It also struck me that Sceviour was mentioned by several of the ATO forwards as a vet player who helped them adjust to the pro game at the end of the season. How could you have an MVP conversation without including the team's leading goal scorer who also finished number two in league scoring as a rookie? That would be the bulk of the case for first-year man Matt Fraser. The obvious mark against him in this regard is defensive play. That was a problem for the entire Stars squad this season. The rookie did make huge strides in the back half of the season. At the end of December, he was at minus-11 but finished the season at minus-13 and even had a plus-6 month of March. Fraser notched five game-winning goals and had eleven PPGs on the season. Fraser cooled off in 2012 on that mark though, as he only collected three PPGs from January on. I think Fraser had a monster year and definitely a good one to build on. I don't think he's the MVP for this team this season, but he is definitely a nominee worthy of consideration. A constant competitor for his three years in Cedar Park, Francis Wathier deserves to be in the discussion for team MVP. Wathier set career highs in assists (24) and points (42). He only missed tying his career high goal mark of 19 by one. In a bad defensive year, Wathier was always strong on the backcheck, usually the first back to the zone among the three forwards, and finished with a team-best minus-4 (among players who were here all season). Along with Sceviour, Wathier was a mentor for the younger players on the team. Glennie's physical tone had to have been picked up from Wathier, who seemed to know just when to go in for that big check and bring the fans and his team back into the game. Wathier is another one of those every-situation players. He is always willing to go down to block a shot but was a workhorse for the Stars nonetheless, missing only one game this season. Additionally, he collected seven power play goals this season, second only to Fraser on the team. Who do you think is the winner? Did I miss someone? Let's talk in the comments. 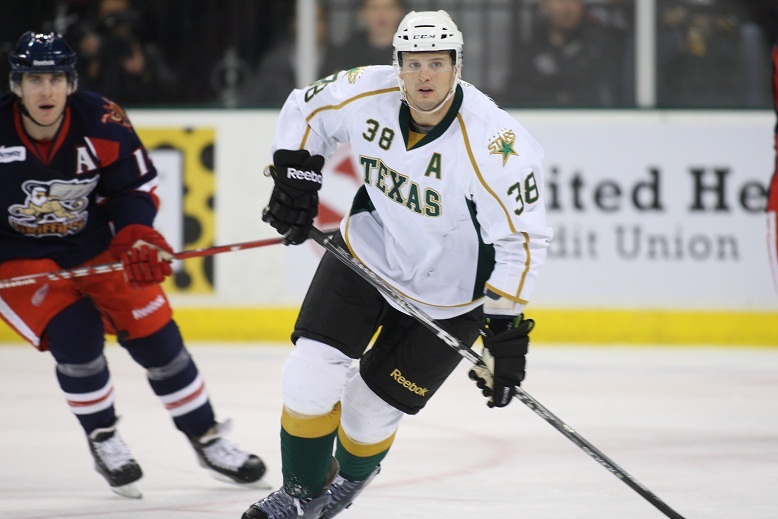 The Texas Stars signed a lot of PTO players this season. In all, Texas had more players suit up for a game this season (44) than in any other previous season. When players went down in Dallas or Austin, the cupboard was barer than bare in terms of ECHL or CHL callups. Dallas had just two players on contract in the ECHL this season, neither of which were called up for any games this season. When those injuries happened, Texas had to go the PTO route. Overall, these seven PTO skaters factored into 55 games for Texas. In those 55 collective games, they had just three points, a goal off the stick of NHL vet Tyler Arnason in the first game of the season, a 7-0 win, and two assists from Brenden Connolly. The same seven players were minus-24, collectively making them the worst "skater" on the team in that category (minus-33 over 76 game season). While it probably wouldn't have been possible for a different setup of callups to completely turn around this season and place Texas into the playoffs, it was definitely a one of many factors contributing to the playoff miss and last-place finish. It's been a while since the Idaho Steelheads were treated to a true NHL prospect that didn't wear goalie gear. The Boise faithful loved players like Tyler Beskorowany and Richard Bachman. However, there have been truly few players on contracts to Dallas spend significant time in Boise in the past few years. Michael Neal is the one player who has been there for a good period of time, but he is unlikely to be re-signed this summer. 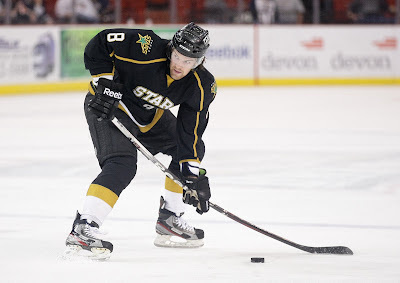 Mathieu Tousignant spent 20 games in Idaho in 2009-10. Now I'm not saying that half the roster needs to be made up of Dallas contracts in the ECHL. That's not really possible even, given the 50 contract limit. What I am saying is that Dallas, and perhaps Texas to an even greater extent, needs to be concerned with making the depth signings. I'll point to the case of Kael Mouillierat as an example of how such things can slip you by. 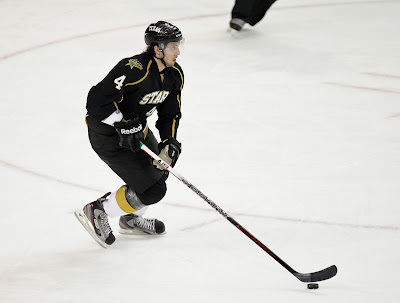 Mouillierat played only six games for the Texas Stars in 2010-11 but collected two assists and, in my opinion, showed a spark of a lot more. Texas had an opportunity to bring Mouillierat on under an SPC for the 2011-12 season, especially since he had signed with Idaho again for this year. Mouillierat started the season with Idaho, but instead signed an SPC with the Bridgeport Sound Tigers after going there on a PTO. In Idaho, he was a point per game player at 14-13-27 in 27 games. In Bridgeport, Mouillierat played 44 games, collecting 8-15-23 and a plus-16 rating. While I realize that Bridgeport plays a different system than Texas so some numbers may vary, it has to be said that a stat line of 8-15-23 over 44 games would be much preferred over one that read 1-2-3 over 55 games. So how does this change? The influx of young talent may be helping this cause this coming season more than anything else. Early numbers show that Texas could have an over-abundance of defensemen. Even without Lukowich or Fortunus re-signing, Texas could be sporting eight of their own. At least one of those will make their way down to Idaho and be a steady callup for Texas throughout the season. That is what was supposed to happen for Jace Coyle and/or Hubert Labrie for most of this season. Coyle's game likely suffered for it; he only made it into 48 games this season, where he probably should have seen ice time every night in Idaho instead. This problem also gets better if Dallas signs a depth forward or defenseman to an NHL contract for the AHL team. That's sort of beating a dead horse around here at this point. Elite AHL scoring/defense is something this team needs badly to compete and teach the younger players how to be professionals in the league. Over the next few weeks here, I'm going to break down the MVP and Most Improved Player races, along with my opinions on individual performances for the year. I'll also take an early look at the roster for next season, including best guesses on who is gone and who is staying. Monday's firing of head coach Jeff Pyle and assistant Jeff Truitt was a swift reaction to disappointing season. I posted my initial thoughts Monday immediately after the firing was announced. Now that I've had some more time to think about it, I have come to the conclusion that this arrangement was doomed to fail from the start of the season, whether it was this year or somewhere down the line. At some point, the system conflict between Coach Gulutzan and Coach Pyle would lead to one of the two leaving the Stars system, more likely Pyle than Gulutzan. When the hiring of Coach Pyle was announced last year on July 13th, my only question in the public session of the press conference had to do with systems alignment. Scott White had previously intoned the importance of having the entire minor league system aligned and I was wondering how that would work with Pyle's more up-tempo style. At the time, Scott White said, "We're going to play a similar system to Dallas. We haven't done that in my tenure. I know Coach Gulutzan's system works, and I'm looking forward to seeing it implemented throughout our group." "I think when the systems are the same, it's easy for the kids to develop. In a lot of situations you'll have the NHL team with one system, the [AHL] team with another and the ECHL with another. So if a kid comes up from the ECHL, it's going to take him time to learn the system. Same things with the [AHL] to the NHL. Now with continuity, you have the guys go up and they already know the system. "Now you can focus on the technical parts of it. That's going to make it easier. Again, if you're working on the little things, these kids are going to get better. If these kids want to move up, they need to do the little things, and that's the most important thing about hockey." This is great quote material but the proof is in the pudding. If you were to compare a typical Glen Gulutzan coached hockey team with a Jeff Pyle coached team, you would not see many similarities. Let's enumerate some of the differences here. One of the most obvious differences (because it's a matter of counting) is the two-man forecheck that Pyle plays. Gulutzan only plays a one-man forecheck. In this system, Pyle is more likely to generate turnovers but less likely to have adequate defensive coverage if a breakout pass makes it out of the zone. Another difference is the way that the defense plays the man and the puck in their own zone. Texas's defense played off the man this year, more casual with taking the body and attempting to force turnovers. Dallas goes right at them and plays the man in the zone. In the offensive zone, Pyle focuses a lot of time on cycling the puck in the corners and getting it back out to the D-men on the point. Coach Gulutzan is more likely to use the half-wall to make space on the perimeter. Overall though, the game just feels more offensive focused under Pyle. Pyle was often quoted as wanting the players to "go" if they get the chance. It was clear the way they played that this was true. Texas finished with 2.95 goals per game, higher than Texas's 2.66 last season but lower than 2009-10's 2.98. The real difference was in the goals against at 3.30 per game. Previous finishes included 2.63 in 10-11 and 2.48 in 09-10. A team commitment to defense was missing. Not all of that can be heaped on Coach Pyle though. It's hard to tell a player to follow one system when that player knows that a completely different system will be taught at the next level, which is where he wants to be ultimately. In the end, you wound up with those nights where the quote of the game was "We had some players buying in and some who didn't." That happened far too often this season. It was probably unreasonable on the part of Dallas management to expect Coach Pyle to change his coaching style after twelve years of success in the ECHL. He only missed the playoffs three seasons in that span. Also keep in mind that Pyle was GM in addition to coach in the ECHL. He was able to choose players that complimented his system and, over the years, hone that system to a sharp edge. With Dallas, he walked into an already established personnel base and was unable to mold the group to fit his style for various reasons as we've discussed. Coach Pyle said it himself in the first conversation I ever had with him, on the phone on July 13th. "[The Dallas organization has] been successful with the direction Glen's been heading in. If that's the direction they've been heading in, they need to stay that direction." Now Dallas needs to seriously re-evaluate what they want from their minor league affiliate. If they want a team that very closely mirrors the systems of their major league club, they will need to find a coach who already plays that style. Asking someone to come in and change their stripes after decades in the business is not only unfair to the coach, but also to the players, fans and future of the franchise. 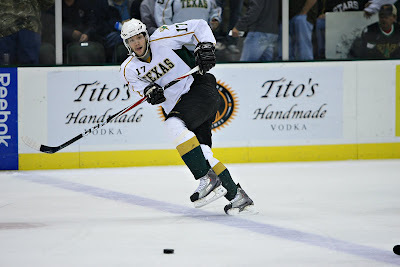 The 2011-12 campaign came to an end this weekend for the Texas Stars (31-40-3-2, 67 pts, #15 Western Conference). For the first time, this franchise is not going to the playoffs. Less than twelve hours after returning from their final road trip, the axe fell. Dallas announced the firing of Coaches Jeff Pyle and Truitt. As the saying goes, you can't fire all the players. Realistically, this is something that most have been anticipating for a while. Rumors of Pyle losing the room and conflict with veteran players have been bubbling up for a while. Dallas has also not been pleased with Texas's performance this season, as Joe Nieuwendyk told ESPN Dallas yesterday. Despite lip service at the beginning of the season that the major and minor league clubs would match up their on-ice systems, they never did. Coach Pyle's heavy forechecking style never changed and didn't mesh well with Coach Gulutzan's more defense-first systems. GM Scott White has a stated desire to build his teams on solid D and goaltending, neither of which was solid under Pyle this season. With the number of prospects now coming through the Stars system, the alignment of the Stars major and minor league on-ice systems is paramount. Even if Texas had some success this year, the system clash wasn't going to be viable long-term. Texas now has a 50/50 record on ECHL coaches. My bet is that Joe Nieuwendyk spends a lot of time looking at NHL assistants. The organization needs a coach who has a proven record of developing prospects to NHL success. That search will probably start in earnest once the playoffs are over. The Dallas Stars wasted no time this morning in beginning a changing of the guard in Austin. Less than 12 hours after the team returned to Austin for the final time, it was announced that both members of the Texas Stars coaching staff have been relieved. After making the playoffs two years in a row, Texas had the second worst record in the league this year and missed the playoffs for the first time in franchise history. Dallas has been saying for a while that there would be big changes this offseason. Keen (and even less-than-keen) observers have been assuming for a while that this would start behind the bench first. Rumor was that Dallas was unhappy with the performance of the team for quite a while. The clash in playing styles also could not have helped the relationship. Coach Pyle's heavy forechecking system did not complement the style that Coach Gulutzan plays in Dallas. GM Scott White had stated strongly that his teams are usually built on solid goalies and defense, two of the worst aspects of Texas's game this season. Texas has now had a 50/50 record on ECHL coaches. My bet is that Joe Nieuwendyk spends a lot of time looking at AHL and NHL assistants. The organization needs a coach who has a proven record of developing prospects to NHL success. That search will probably start in earnest once the playoffs are over. On a personal note, Jeff Pyle was a great guy to work with from a media perspective. He was always a great quote and was more than willing to answer any question. He came out to take questions just as quickly after a 7-0 win as he did after a 6-1 loss. I've had a few interviews with him where the main content of the story was done in the first few minutes, and he spent twice as long just shooting the breeze with me about hockey. Coach Pyle had a lot of success in the ECHL, and I think he will find another job in hockey very soon. I wish him and Coach Truitt the best of luck. In a game with playoff implications across the conference, Houston needed a little bit of help but their first order of business was two points against the Texas Stars. After the first period, they knew they'd gotten the help. It was up to them from there to win. Texas opened the scoring in the second, but Houston answered with two goals to get the final W of the regular season. Texas finishes the season at 31-40-3-2 and Houston will be going to the playoffs. Texas and Houston skated to a scoreless first period despite 21 combined shots in the frame. Fifteen of those came from the Houston Aeros in the direction of Jack Campbell. Campbell, starting his third game in as many nights, got no help from his teammates in terms of shot blocking in the first. Despite that, it was scoreless after one. The Stars opened the scoring in the second period with Brenden Dillon getting his 6th of the year on a sharp angle shot. The puck bounced off goalie Matt Hackett just the wrong way and went in to make it 1-0 for Texas. The Aeros tied it up with 2:33 left in the second on a rebound goal by Kris Foucault. Houston would finish the period on the power play but things would be even at one after forty. A strong forecheck from Joel Broda forced a mishandle by Jack Campbell just 31 seconds into the third. Broda poked it past Campbell for the 2-1 lead. Texas gave it their all in the last few minutes of game 76. They pulled Campbell and called a timeout to try and spoil the Aeros' season. Hackett stood tall and the Aeros will start their playoff push Wednesday or Thursday against OKC. Despite all the success of the early season, the Stars come to Houston today for a game against ninth-place Houston on the last day of the season. To clinch a playoff berth, the first thing Houston must do is win. This is a big game for Texas, in that they can ruin Houston's season with a win today. Due to tie-breaker rules, in order to control their own destiny they must beat Texas by nine goals or more. If they cannot do that, they need San Antonio to lose in regulation versus OKC or Charlotte and Milwaukee to stay in regulation. San Antonio is still fighting for their playoff spot as well and OKC has been locked in for weeks. Since the game is at San Antonio, OKC is likely to rest veterans. The league has to be happy with the new playoff format. If you combined the playoff "are they in or are they out" drama of the last two years, it wouldn't add up to the drama in just today's games. There are still eight teams vying for just six playoff spots: two in the East and four in the West. Texas will probably roll out Tyler Beskorowany in net, since Jack Campbell has already started the last two of the three-in-three. It's possible that Campbell could start, but at this point, why? A start for Campbell against playoff-hungry Houston with 121 minutes already logged on the weekend seems like a poor decision. In stats watch, Matt Fraser leads the league in goals this season by just one on the final day. Norfolk's Cory Conacher is just behind him at 36. The Admirals do play today, going for their 28th straight win. Personally, if Texas had been in the playoffs, Fraser would have also been a strong choice for Rookie of the Year. Good players on bad teams do not often collect postseason awards, however. The Oklahoma City Barons jumped out to a lead in the first and never looked back, holding at least a one goal advantage on Texas all the way through the final horn. Mike Hedden was the star of the night, scoring on a penalty shot in the second and at even strength in the third. The penalty shot was only Texas's second of the season, both at home and both goals. The other was by Colton Sceviour. Here's the release, since I was unable to watch live. 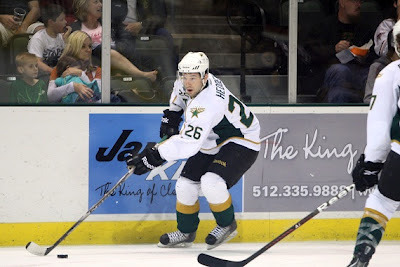 The Texas Stars (31-39-3-2, 67 points) were defeated by the Oklahoma City Barons (45-21-4-5, 99 points) 5-2 in front of a sold- out crowd of 6,863 fans at Cedar Park Center on Saturday night. Defenseman Bryan Helmer and forwards Josh Green, Mark Arcobello, Magnus Paajarvi and Hunter Tremblay scored for the Barons. Oklahoma City goalie David LeNeveu (18-12-3) stopped 23 of 25 shots bringing the team’s road record to 24-9-1-3. Left wing Mike Hedden scored twice for the Stars. Texas goalie Jack Campbell (4-6-0) stopped 21 of 25 shots in the loss. 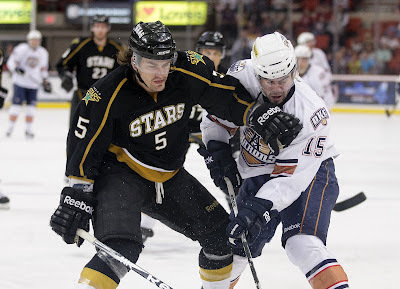 The Stars travel to Houston for their final regular season game on Sunday, April 15th at 5:05 p.m. The Barons opened the scoring with 6:39 remaining in the first period. Defenseman Bryan Helmer slipped the puck past Campbell, giving Oklahoma City a 1-0 lead. Forwards Tanner House and Chris VandeVelde set up Helmer’s third goal of the year. Oklahoma City grabbed a 2-0 lead early in the second period. Left wing Magnus Paajarvi slapped a shot to the back of the net just 1:15 into the frame. Left wing Teemu Hartikainen registered an assist. Texas got on the board at 5:35 of the period. Left wing Mike Hedden scored off a penalty shot, cutting into Oklahoma City’s lead at 2-1. The Barons jumped out to a 3-1 lead as center Josh Green tipped the puck in with 3:15 left. Defensemen Martin Marincin and Alex Plante helped on Green’s 16th tally of the season. The Stars cut into the Barons’ lead again just 1:41 into the third period. Left wing Mike Hedden netted his second goal of the night off a Dan Spang shot. Right wing Alex Chiasson also provided an assist on the 3-2 tally. The Barons answered back at 5:07 with a goal from right wing Mark Arcobello. Defenseman Dylan Yeo and center Tyler Pitlick set up the play for the 4-2 lead. Oklahoma City struck again with nine seconds remaining. Left wing Hunter Tremblay put in an empty-net goal for the 5-2 final. Tonight's attendance was 6,863. It was Texas's third sellout of the season. Despite a comeback thanks to the power play, Texas could not seal the deal in overtime as they earned just their third OT loss on the season. San Antonio's Jon Matsumoto pushed the Rampage over the edge with his 23rd of the season 72 seconds into the overtime period at the AT&T Center. Campbell stopped 29 of 33 in the game and Texas bombed Jacob Markstrom, who had 39 saves on 42 shots. The Stars were 2/3 on the power play. Here's the release, since I was unable to watch live. Texas got goals from Morin, Spang and Fraser. The Texas Stars (31-38-3-2, 67 points) were defeated by the San Antonio Rampage (40-29-3-2, 85 points) 4-3 in overtime in front of 11,780 fans at the AT&T Center on Friday night. Center Jonathan Matsumoto scored 1:12 into overtime, helping the Rampage move closer to its first playoff berth since 2008. San Antonio goalie Jacob Markstrom (16-12-1) stopped 39 of 42 Texas shots to preserve the victory. Texas goalie Jack Campbell (4-5-0) stopped 29 of 33 in the loss. Stars right wing Matt Fraser scored his AHL-leading 37th goal of the year, tying the game midway through the third period and forcing overtime. Stars center Travis Morin scored a goal and added an assist, pushing his point total to a team-leading 66. Defenseman Dan Spang also scored and defender Jordie Benn added two assist, as Texas fell to 13-22-1-1 on the road this season. The Stars travel back to Cedar Park for the final home game of the regular season, a 7:00 p.m. faceoff with the Oklahoma City Barons at the Cedar Park Center. San Antonio opened the scoring for the evening at 12:03 of the first period. Rookie forward Drew Shore redirected the puck off his skate and into the Texas net for his first pro goal. Forwards Wacey Rabbit and Eric Selleck each had an assist on the play, as San Antonio moved in front 1-0. Texas countered to tie the game at the end of the period. Center Travis Morin snapped a shot past goale Jacob Markstrom with 4.5 seconds remaining in the period, tying the game 1-1. Defensemen Brenden Dillon and Jordie Benn each had an assist on Morin’s 13th goal of the year. 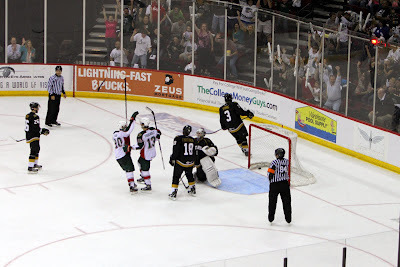 The Rampage gained a two-goal lead, scoring twice in the first nine minutes of the second period. San Antonio forward Bill Thomas scored his team-leading 27th goal of the year at 3:16 of the middle frame. Thomas put a rebound past Cambell for the 2-1 lead. San Antonio forward Eric Selleck extended the lead to 3-1 at 8:53, scoring his fifth goal of the year off a backhand shot. The Stars used a power-play tally by defenseman Dan Spang to trim the San Antonio lead to 3-2. Forwards Alex Chiasson and Travis Morin each had an assist on Spang’s fourth goal of the season. 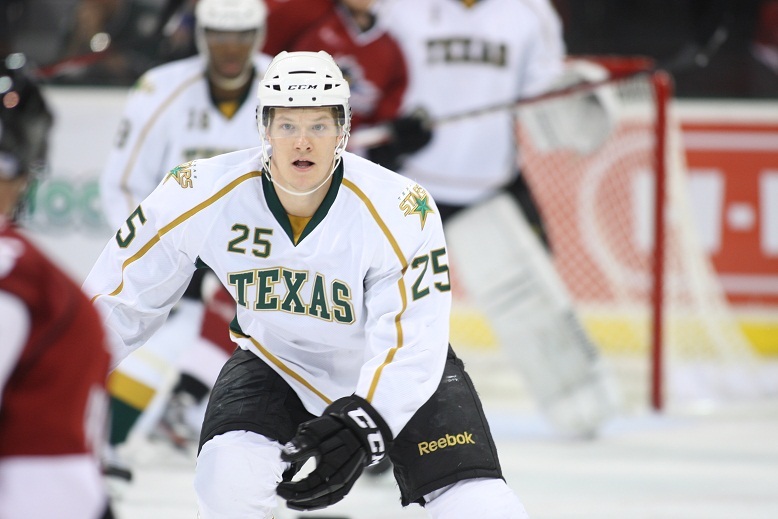 In the third period, rookie forward Matt Fraser tallied his AHL leading 37th goal of the season to tie the game 3-3. Fraser’s power-play goal was also assisted by Jordie Benn and Maxime Fortunus at 9:26 of the final frame. Fraser beat goalie Jacob Markstrom with a wrist shot from the left-wing circle, tying the game and forcing overtime. The Rampage capitalized off a 2-on-1 rush just over a minute into the extra session. Michal Repik centered for Jonathan Matsumoto, who redirected the puck past Jack Campbell for the 4-3 overtime win. The final weekend of the regular season begins tonight with all 30 AHL clubs in action tonight. For Texas, these are the last three games of the 2011-12 campaign. All three of this weekend's opponent are hoping to play quite a few more than that this April, May and, if they're lucky, June. It all starts tonight with the San Antonio Rampage. The Rampage lagged early in the season but caught fire through the mid-season thanks to heroic play by Dov Grumet-Morris. Now they have the chance to clinch their first playoff berth since 2008 and only their third berth overall in their history (2003 being the other). They will need some help, but all clinching scenarios start with a win at the AT&T Center. For the Stars, this weekend will likely be the first time that a goalie not named Campbell starts since March 19th. Jack Campbell has commented positively on his feeling of conditioning so far in the pros. Still, you almost never see a three-in-three started by the same tender each night. My guess is Campbell goes tonight and at home tomorrow and Beskorowany starts Sunday. 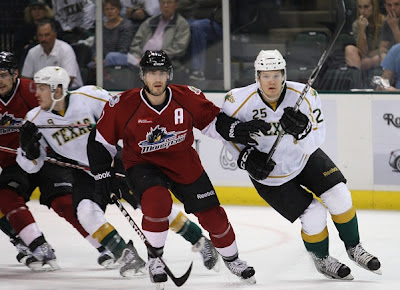 This weekend marks the last three games of the Texas Stars 2011-12 campaign. In a season without playoffs, we are certain that when the buzzer sounds on Sunday afternoon in Houston, the book will close on this year's edition of the Stars. 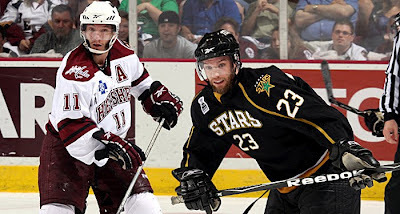 As has been alluded to here, by the Texas Stars administration, and even by Joe Nieuwendyk, the Texas Stars will look drastically different in October. That means fans will be watching many of this year's Stars for the last time in a Texas uniform on Saturday. I'm not going to get into the specifics of who I think is on the way out, who may already be gone and who might be back and why at this point. This post is more to remind you to take a few seconds on Saturday night to drink it all in. Many of the players on this year's squad who could be leaving have been with Texas since that very first game in October of 2009. I was talking with some fans this past week about the slower decline of the Stars season this year. Texas has been out of the playoff race for a while, and so fans have known that April 14th would be the final hurrah for some time. In those fans estimations, it has given them more of a chance to begin 'closing the book' on the season. If you remember back to last year, Texas was eliminated in a Game 6, on the road. Fans were hoping that they would see the Stars back for another two games at least in the second round. Milwaukee ended those hopes and made Game 5 the last game in a Stars uniform for favorites such as Greg Rallo and Aaron Gagnon. Rallo and Gagnon bring up interesting points as well in the, let's call it, "grieving process" for fans. In retrospect, I think you'd be hard pressed to find a fan who still begrudges Rallo for leaving the team, even if it was to rival San Antonio. Knowing now that he got the chance to play in an NHL game for the Panthers this season, you have to be happy for him as a person. You also should be proud that the Stars were the AHL club that picked Rallo out of the ECHL and gave him a chance at a full year's contract. So when the Stars take the ice for the final home game this Saturday, take a few extra seconds to drink in the scene. Enjoy the eternal hustle of Francis Wathier. Admire those sometimes acrobatic blue line offensive zone keeps from Maxime Fortunus. Appreciate the ever-present grit, determination and leadership in captain Brad Lukowich's game. Nothing is for certain yet with these players (all unrestricted free agents*), but this summer I think you might regret not taking the second, if you don't. * - I'm not trying to imply anything about these three players by listing them here. They are all unrestricted free agents, which means they can go wherever they want after the season is over. Also, they have all been with the team since the first season. Any of the three not coming back would be a tough loss for the fans. Just know that it is a possibility, just like it was with Rallo and Gagnon, and take that extra second to enjoy and remember on Saturday. Texas's two feeder clubs were both involved in their league playoffs this week. Allen battled the Texas Brahmas in the first round of the CHL's Ray Miron Cup Playoffs. Idaho took on the Ontario Reign in the Kelly Cup Playoffs. Idaho advanced out of the first round with a decisive 5-0 victory over the Reign. The best of five series went all five games, concluding in Ontario on Monday night. Idaho goaltender Jerry Kuhn stopped 46 shots for a shutout. The series had been marred by odd penalties and a very dirty overall game from the Reign. For example, Kuhn was given a major penalty and a game misconduct in the second period of Game 2 for clipping. The series averaged forty PIMs per game between the two teams. I've had good reports of Hubert Labrie's play in Game 5. He laid a devastating open ice hit in front of the Steelheads bench in the early stages of the first period. The hit really energized the bench and set the tone for the rest of the game. Labrie was plus-2 with no points. Dallas contracted players Michael Neal and Tristan King actually competed for opposing teams in this one. Neal had two goals and four assists in five games for Idaho. King collected two assists in just three games for Ontario. The Steelheads will face the Las Vegas Wranglers in the second round, starting on Monday night in Las Vegas. The Allen Americans were not so lucky. Facing elimination in Game 6 of their best of seven against the Brahmas, the Americans fell 4-2 at Texas. The Brahmas jumped out to a 3-0 lead in the first two periods. Allen scored two goals just 53 seconds apart but Texas netted the ENG in the dying seconds of the third to set up the win. This is the first year that Allen has not advanced past the first round of the CHL playoffs. They made it to the Miron Cup Finals in their first season and to the Berry Conference Finals last year. Allen was 6-2 in possible elimination games coming into last night's game. Texas scored early and often in tonight's game against the Chicago Wolves, never looking back after opening a two goal lead in the first. Alex Chiasson and Jace Coyle each picked up their first professional goal. "We play for pride and give it all we've got," said Chiasson, who also assisted on the empty netter. "It was the best game we've played as a team since I've been here." The Stars were up on Chicago by four before the Wolves got their first goal. Chicago, who could have clinched a playoff berth with a point in tonight's game, started former Star, Matt Climie, but pulled him after he allowed three goals on just eleven shots (Chicago backed into the playoffs thanks to Rochester's loss). Texas tender Jack Campbell picked up second star honors with a 34 save performance. Texas opened the scoring in the first with Angelo Esposito tapping in a puck that had dribbled in between Climie's legs. Alex Chiasson followed up with a fantastic sweeping move down the right wing circle, crashing the net and poking the puck past Climie for a 2-0 lead. It is pretty obvious that size is a huge asset for Chiasson, who makes a lot of space for himself as he carries the puck. The Wolves took a minor for elbowing and the Stars would go to the power play early in the second. A deft pass of only a few feet by Colton Sceviour changed the angle just enough for Climie that Tomas Vincour was able to rifle one past the tender. "You can see Vincour is a level up on everyone as he's been up in Dallas," said Chiasson. That would end the night for Climie and bring on Eddie Lack. The Stars would pierce Lack just once in the game, but it was a big one for Texas's rookie blue liner. Jace Coyle recorded his first AHL goal with a slapper from the point that slipped in through traffic in front and the pads of Lack for a 4-0 lead. Chicago brought their game up a notch in the final 24 minutes of the game. "We played to our game plan and were on them most of the night," said Dillon. "We weathered the storm in the third period." Anton Rodin broke up the shutout bid with just over three left in the second. Jace Coyle got stuck with a two on one situation that Rodin finished off for the 4-1 score. Nicklas Jensen, 2011 first round pick of the Canucks, added his first professional goal at 12:34 of the third to cut the Stars' lead to two. The Stars locked things down the rest of the way, however, earning a power play in the last 2:20 of the game to all but seal the deal. The Wolves would pull Lack for the extra skater, but Mike Hedden would collect his 17th of the year with just 1.5 seconds left. Tonight's game was a little peak at what this Stars team could show next season. Something big that I noticed was a lack of what you'd call a "fourth line". There was a lot of skill on the ice for Texas and that matched up very well against the Wolves, especially with last change. When your "4th line" has over 70 points on the season, it's not even fair to call it a fourth line anymore. Perhaps this is why there was so much shuffling tonight. Lots of skill on the bench and Coach Pyle definitely wanted to get it all out on the ice as much as he could. There was a lot of line shuffling, so I can't say that this is 100% accurate. Texas put all sorts of combinations out there to see what worked and didn't. Chicago is a team coming to town with something the play for. Texas is counting down the days until the summer has come. With a point tonight against Texas, Chicago can clinch their berth in the 2012 playoffs. With two, they will be the Midwest Division regular season champions. A cursory look at Chicago's goaltending would have you believe that Matt Climie is superior tender. While he has certainly done well this year, Eddie Lack actually has the lower GAA. Looking at game-by-game stats, in many of his losses, Lack allowed only 1 or 2 goals. Those are winnable games that you can place clearly on the skaters in front of him now working to get the goals. Climie and Lack each have a win against Texas this year. Lack has the only loss. Chicago is a great example of a team that came from the mid-pack and dominated the back half of the season to make the playoffs. Since Christmas, the Wolves put together three, four and even five game win streaks with regularity. They vaulted up the standings and knocked Charlotte out of the top spot in the Midwest. It will be interesting to see what Coach Pyle does with the re-addition of Vincour to the lineup. 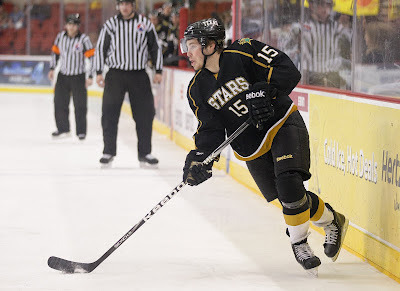 Vincour, who was on the Stars Clear Day roster, was 11-4-15 in just 18 games played this season. He will likely play in the top six, bumping Shawn Weller to the press box in all likelihood. When you look at a roster like this at the end of the season, it definitely makes you wonder what the Stars could have done with all of these players for a full season. That is precisely what the Stars hope to have next season as many of these players will stick around for 2012-13. It's all downhill from here for the Texas Stars (30-38-2-2, 64 pts, #15 Western Conference). With just four games left on the schedule, the season is officially reaching its end this week. Texas will have its full roster of Clear Day players for the final four games, including recently assigned Tomas Vincour, and all of their ATO signees as well. In a rough season, the key at the end is to find positives to build on for next season, not only for Texas but positives that will trickle up to Dallas. First among these is one that Dallas fans have bemoaned for much of the season: the power play. Coach Jeff Pyle's power play was a revelation in Texas early. The Stars were clicking along at 30% in the first few months of the season, eventually cooling down to 19.0% currently with 61 goals, ranking 9th in the league. Pyle was renowned for his power play ability in Gwinnett. It is clear that he has a knack for the man-up situation, but a combination of depleted player base and the league learning his tricks depressed that number as the season wore on. Second, I think several players had breakout seasons. Matt Fraser is the most obvious with eye-popping numbers. Fraser has 36 goals on the season, leading the AHL as a rookie. He needs to work on his defensive game, but it's a great start. The entire line of Colton Sceviour, Francis Wathier and Scott Glennie put together a great back-half of the season. As I documented here, I believe Sceviour has earned a spot in the NHL with his play this season. Many of the same arguments could be made for Francis Wathier, but he has age working against him. Scott Glennie has added physicality to his skill set thanks to being paired with the two through the season. Finally, the early indications of the ATO signee play have all been good. That is something to build on. The biggest question that remains is what changes around them. 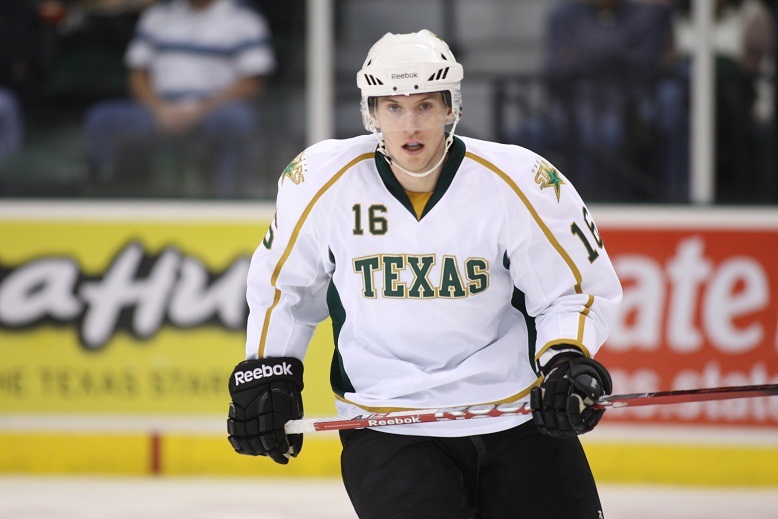 Regarding that, Texas Stars president Rick McLaughlin was recently quoted, "We look forward to seeing the new crop of Texas Stars players to help turn things around in 2012-13." Discussions about whom are ones we will surely have here and on 100degreehockey.com as the months wear on. Three years ago, Colton Sceviour joined the Texas Stars in their first season. He was a rookie on his second year of an entry level contract and looking to make an impact on the new team. Playing third line minutes, Sceviour potted nine goals and 22 assists in 80 games. He played in all 24 playoff games and picked up a goal and seven assists. The second year, he would increase his totals to 16-25-41, and this year in 71 games, he has 21-30-51. At the end of this season, Sceviour is a restricted free agent, giving Dallas first right of refusal on his contract status. Dallas should either sign Sceviour with the intent of keeping him in the NHL or let him go to a team that will. In talking to Sceviour, Dallas has been very clear with their idea of what his role would be in the NHL: bottom six energy guy. What are the key characteristics of a bottom six energy guy? Number one has to be defensive responsibility. You don't want your third and fourth lines costing you goals. Sceviour has this. Despite his minus-8 this season, he has been put on the ice in tough situations. The minus-8 is not an indictment of his defensive skill, but a testament to it. Along those lines, a nice bonus is the ability to play the PK. Sceviour has done this with facility over the past two years. It was a stated goal of his to be a contributor on the PK in year two, and he is now a go-to guy, playing the 3-man PK as well. It's tough to judge the turnover numbers for players in the AHL, since those numbers aren't publicly available if they're even kept. Both Coach Pyle and Gulutzan's willingness to put Sceviour out in hard situations show that he is trusted with the puck defensively. You're also going to want someone who isn't afraid to take the body and go to the hard areas of the ice to make plays. We've talked about it before here, but playing with Sceviour and Wathier is the main reason that Scott Glennie has added physicality to his list of traits. Sceviour played those rough and tumble minutes often in his second year, lining up with Mathieu Tousignant and Ray Sawada frequently. Finally, having a good set of hands doesn't hurt, so you don't freeze up when presented with a good scoring chance. Twenty-one goals on the season say that Sceviour is not going to do that. Additionally, he has had a knack for key goals, scoring six game winners. That's six wins out of the thirty total the Stars have this season. His point generation has ticked up as well with a career high in assists. While a bottom six player is going to get limited offensive zone start and time, you want them to make the most of it. For all these reasons, Colton Sceviour is ready for the big show. Dallas needs to recognize this and sign him with the intent of keeping him in the NHL this season. At worst, he is a drop in replacement for a fourth liners Toby Petersen or Jake Dowell and probably for $300,000 less. At best, he could be a third line winger who can take faceoffs and play the penalty kill for Dallas. At minimum, Colton should look for a two-year deal that is two-way the first year and one-way the second (Similar to what Aaron Gagnon got in Winnipeg). That shows that Dallas sees him in the NHL soon and could potentially keep him there in 2012-13 if he shows well in training camp. If the team offers another one-year, two-way contract without much hint of NHL time, that is where the trouble comes in. Since he cannot go on the free market due to his restricted status, Sceviour would "waste" another year with Texas, instead of in the big show. If Dallas doesn't see themselves keeping Sceviour in the Big D this year or next, they shouldn't tender him a qualifying offer this summer, making him a UFA and allowing him to find NHL work somewhere else. It is a tough pill for fans to swallow surely, but he is ready and deserves the shot somewhere, even if it isn't Dallas. With the Dallas Stars' season ending on Saturday night, Texas received four players from the NHL club to finish out the final four games in the AHL. Scott Glennie, Brenden Dillon, Jordie Benn and Tomas Vincour were the assignments. In addition, Hubert Labrie has been assigned to Idaho to help them in their winner take all game tonight in Ontario. The oddball on this list might be Tomas Vincour. However, he was on the Stars' clear day list and was a quality contributor at this level this season before his callup. He will probably bump a guy like a Shawn Weller from the lineup, as Vincour will almost certainly join the top lines for the remaining four games. Expect Joe Nieuwendyk to be in town for at least one of the two remaining home games to evaluate the talents of Campbell, Smith, Chiasson and others. Finally, Labrie will be a much needed addition to the Idaho blue line. Thanks to injuries and some borderline suspensions, Labrie is the sixth D in Idaho. He will probably get heavy minutes there as they play their fifth game of a best-of-five, facing possible elimination at the hands of the Ontario Reign. Former Colgate senior and current Texas Star Austin Smith did not win the Hobey Baker Award last night. Instead the award went to Jack Connolly, an undrafted forward out of the University of Minnesota-Duluth. It stings that Connolly beat out Texas-native Smith for the honors, but in the end, it may be better that he didn't win, especially in the context of the Dallas Stars system. For those unfamiliar with the Hobey Baker Award, it is often called the equivalent of the Heisman Trophy in college football, but for college hockey. Previous winners that you might know include Ryan Miller, Chris Drury, Jason Krog, and Blake Geoffrion. Previous winners you probably don't know are the reason why it doesn't matter that Smith didn't win. In this way and a few others, it is probably more like the Heisman than anyone really lets on. It is often said that the Heisman goes to the best player on a top 5 team. Also, it tends to go to a major BCS conference school. Here's a little example of what Austin Smith was up against. Probably the best comparison would be to imagine Austin Smith as Case Keenum, the recently graduated quarterback from Houston of Conference USA. Houston is a school with a tier two status in terms of Texas football pedigree and plays in a conference that is not an automatic qualifier for the BCS. Keenum, however, put up fantastic numbers in his career there. Critics still maligned the level of competition he faced, which cast doubt on those numbers. Now replace Keenum with Smith, Houston with Colgate and Conference USA with the ECAC. That's what kind of competition he was up against. UMD (Stanford in the above analogy) is a school with a much better pedigree and plays in the "more competitive" WCHA (Pac-12). Additionally, the Hobey is not a sure fire indicator of future success (similar to the Heisman). The real reason why it's alright that Smith didn't win the Hobey is the expectations game. The last two Dallas Stars prospects to win the Hobey, Junior Lessard and Marty Sertich, played a total of eight games in a Dallas Stars uniform, all Lessard's. Again, this is an apt comparison to the Heisman Trophy. For every Tony Dorsett or Earl Campbell, there are many Troy Smiths, Eric Crouchs and Jason Whites. Now I will admit that the comparison breaks down a bit here because football players are drafted after college and hockey players are drafted at 18. However, having a crown placed on your head saying you're the best still weighs you down whether you were already drafted or not. The Dallas Stars announced this afternoon that Scott Glennie and Brenden Dillon will both get into their first NHL game tomorrow night against St Louis. With the Stars out of the playoff race, Dallas is expected to sit some of their forwards who had been nursing injuries, including Ott, Morrow, Ribeiro and Dvorak. Dillon is a fine callup for Dallas. He's suffered a bit this year from the expectations game. He came in with some pretty high ones and had a year that I don't think should be a disappointment for a rookie defenseman. 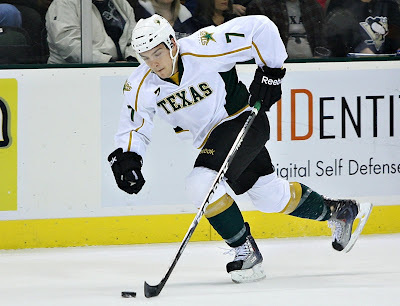 Dillon has skated in every Texas Stars game this season and scored 5 goals and 21 assists with a minus-9. This is a good chance for Dallas to see what they have in the young blue liner. There are more issues with Scott Glennie's callup, in my mind. Glennie has done great work to shed the label of a "bust". He is a rookie by AHL standards but also suffers from the expectations game of being a first round draft pick. He has shown things this year that were never part of his game in Brandon, including physicality and strong forechecking. That came from being paired with two vet forwards, Wathier and Sceviour. In fact, that leads me into my next point. Nothing against the game that Glennie has brought this season, but Colton Sceviour should have been that final callup. Sceviour has been a constant competitor night in and night out. He set career highs in goals, assists and points while consistently playing top line minutes and taking his share of the load on the power play and penalty kill. He is a leader for this team and a major bright spot in a rough year for the club. Dallas should have seen to call him up for one game to give him a chance to show what he can do. He is a restricted free agent this summer, and this non-callup could be very bad for his contract status in the summer with Dallas. Despite the Stars' best efforts early in the game, the Peoria Rivermen showed that playoff teams know how to close out games tonight in Illinois. Peoria got on the board first, but Texas tied things up in the second. However, a two-goal third period from the Rivs doomed Texas's chances at their 31st win on the season. Jack Campbell had 35 saves on 38 shots. Matt Fraser pushed his AHL leading goal total to 36 with two goals in the game as well. Texas had a lot of great chances late in the first period, but the two clubs skated to a scoreless opening frame. 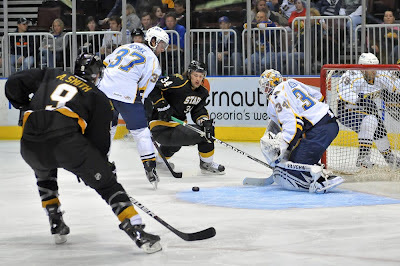 Peoria opened the scoring in the second period with Nesbitt tapping in a pass from Phil McRae on the backdoor. Matt Fraser answered seven minutes later with his team-leading 35th goal of the year. He snuck it under the crossbar to help Texas take a tie to the second intermission. Patrick O'Sullivan, a curse to the Stars while in Houston, struck again from his new home of Peoria. O'Sullivan picked up an unassisted tally seven minutes into the third to push the Rivs ahead 2-1. Adam Cracknell added another goal two minutes later to make it 3-1. While the Stars would mount a late push in the game, it wouldn't be enough. Jack Campbell was pulled with approximately a minute and a half left in the game and Matt Fraser got his 36th of the year with the extra man. If it feels like a while since Texas played Peoria, that's only because it has. These two teams last played on January 20th in Cedar Park and before that twice in October. Peoria is right on the cusp of getting into the playoffs. They find themselves in eighth place this morning, but with Milwaukee, currently in the 11th spot, beating them in points pace. The Admirals have two games in hand on the Rivermen and the two do not play each other for the rest of the season. It is safe to say that Peoria is very hungry for these two points. The Rivs have been riding Jake Allen hard since the departure of Ben Bishop. Allen has started 14 of the last 16 games for Peoria. Overall he has a 2.89 GAA and .916 SV% with an 11-18-2 record. Ben Bishop, however, was 24-14-0. This team is hoping to skate by on that departed effort, as they have lost five of their last six. As usual, TJ Hensick is on the watchlist for Texas as are Jonathan Cheechoo and Derek Nesbitt. Rookie defenseman Cade Fairchild was just named to the AHL's All-Rookie team for his 7-25-32 effort this season. Given the two days' rest prior to yesterday's game and the four days rest after today's game, I think Jack Campbell will go again tonight for Texas. Max Fortunus and Brad Lukowich should be stepping back into the lineup, which could mean Hubert Labrie slides down to Idaho to help the Steelheads in their playoff race. The Stars were outshot, outmuscled and ultimately outscored in this one against the Grand Rapids Griffins tonight. The Griffins' Joakim Andersson potted a hat trick against the Stars, and Francis Pare had an assist on each tally. The Stars got goals from Shawn Weller and Matt Fraser in the game. Jack Campbell had 30 saves on 34 shots. The Texas net was shelled once again early in the game as Jack Campbell faced 17 shots in the first period. He stopped all but the last as Grand Rapids found the net on a power play late in the period. It was Joakim Andersson's 19th of the season and came with just 55 seconds left in the first. Texas only managed six shots in the period. Just three minutes later, though with an intermission in between, Andersson potted his 20th of the year off a one-timer from Tomas Tatar. The Stars would get one back from their fourth liners just 90 seconds later. 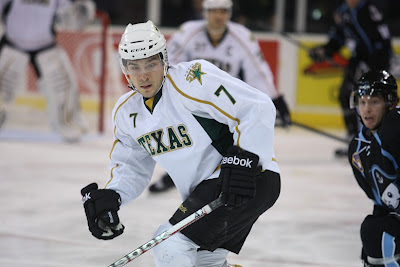 Shawn Weller collected his second goal as a Texas Star off a rebound from a Michael Forney shot. Secondary scoring has been a deficiency for Texas this year. It was a promising sign, but it would only matter if Texas got some more help. Grand Rapids regained their two goal lead as Garnet Exelby found a rebound out in the front of the Texas net for his sixth goal of the year. Less than 60 seconds later, the Stars would answer thanks to their leading scorer. Matt Fraser snapped a puck past Tom McCollum off a faceoff to cut the Griffins' lead to 3-2. The Griffins would add a final nail in the last five minutes with Joakim Andersson completing the hat trick. Francis Pare assisted on all three of Andersson's goals. After two months in the last spot in the Western Conference, the inevitability of missing the playoffs finally was mathematically achieved this week for the Texas Stars (30-36-2-2, 64 pts, #15 Western Conference). For Texas fans, it's a very strange sensation knowing that the season is over after game 76. There will be no second season this year in Cedar Park. Perhaps it has helped that the Stars have been in this spot for so long; the fans have had a chance to come to terms with missing the playoffs. The players know that the fan support has been phenomenal given the on-ice product. "The fact that we still have 6,000 plus fans coming out to support us, it was a great crowd," said Luke Gazdic after Saturday's game. "For us to think it was loud [on the ice], it's rockin' in here." Fans only got one win at home this weekend but had a lot to cheer for. Big game play from Jack Campbell and Austin Smith and re-energized efforts from vets including Travis Morin, Mike Hedden and Luke Gazdic. "The young guys are energizing us," said Gazdic. "They've got legs for days." Campbell's first pro shutout was arguably the best home game of the year for this crew. The fans were into it, chanting his name as they waited for his #1 star announcement and cheering every single save. After GAAs over three and save percentages under .900 all year, Campbell is a revelation in net. It is a credit to the fan base that they have recognized his skill so readily. For now, the Stars play for pride, stats, contracts and the spoiler effect. The Stars' last true road trip of the season sends them to Michigan and Illinois on back-to-back nights to close out two season series. The first will be with the Grand Rapids Griffins this evening in Van Andel Arena. The Griffins appeared to be on a rocket to playoff contention in late February, rattling off five straight wins. A shutout loss in Hamilton started a 6-7-1 streak up to now. Any playoff hopes evaporated for the Griffins with that streak. Goalie journeyman Ty Conklin is out in Grand Rapids, recalled to Detroit shortly after playing a two game set in Texas in early March. Tom McCollum is the man right now in net for the Griffins, starting the last seven games but carrying a 3.48 GAA and .893 SV% on the season. There is no reason to expect anyone other than Jack Campbell to lead Texas out onto the ice this evening and most evenings for the rest of the season other than the final weekend three-in-three. With Jordie Benn back in the lineup for Texas, expect at least one of the Stars defensemen to sit, if not two. Coach Pyle has rolled seven blue liners for the past few games. Hubert Labrie is the only defenseman from Texas on the Idaho Steelheads' playoff roster. It is possible that they could assign Labrie for the Steelheads' playoff race and skate either six or seven. Some ice would certainly be more valuable than sitting in the press box. Just a few quick notes on an otherwise quiet hockey news day for the Texas Stars. First, Taylor Vause headed back to his home in Calgary this morning. Vause broke his foot blocking a shot in Thursday's game against Hamilton. I really liked his game in the short time he had at Texas. Vause had 1-1-2 in just five games, including a shootout game winner at Lake Erie last week. He was a product of the Dallas Stars prolific WHL scouts and I am hoping that he will be back on an ELC next season. Coach Pyle indicated though that he has a decision to make. Vause could still attend college and may make that decision with his family. Second, the AHL announced the AHL IOA/Specialty Men of the Year for each of the member clubs yesterday. For the second year in a row, it was Brad Lukowich garnering the honor for Texas. Lukowich and his wife Cara are extremely active in the community. I'll just simply link the release because there's just so much that he's done this season and the Stars did a good job of summarizing it in the release. With Texas Out of the Playoffs Officially, What Now? Realistically, it had been inevitable since late February. Yesterday, inevitable became actual. With the 8-4 loss to Lake Erie, Texas was mathematically eliminated from the playoffs. It's a weird feeling for Texas Stars fans. After two years of success in the regular season and a berth into the "second season", it's not going to happen this season. Texas will suit up for the last time on April 15th in Houston, and that will close the book on 2011-12. Perhaps it is a little easier to digest for fans since the Stars have been out of the hunt for so long. If the elimination came on the last day of the season (a la Dallas 2010-11), this would be a huge heart breaker. It feels like the fan base has come to terms with the situation slowly and is looking towards next year. So what is there left to play for in what many consider a lost season for this AHL club? The first answer is obvious. Texas is playing for next year's development and team dynamic. The young guys are here to get a little taste of the pro ranks before joining full force next season. What they have shown so far gives fans promise that Texas will be better next season. Other prospects on the horizon for next year but still playing in juniors give hope for the blue line as well, but that's a topic for another post. Second, several players have talked about pride. After yesterday's loss, Mike Hedden called the performance "embarrassing". At the end of the day, these are very competitive people on the ice no matter the score or playoff situation. Another, more cynical, point is the matter of contracts. While it's usually a faux pas to bring up what people make in polite conversation, for professional athletes, contracts are a huge talking point and a big part of the story. Several Stars are on contracts that expire at the end of the season, including Colton Sceviour and Luke Gazdic (NHL) and Mike Hedden and Shawn Weller (AHL). If they want to make their value evident, they know that recentness is just as compelling as quantity in terms of accomplishments. 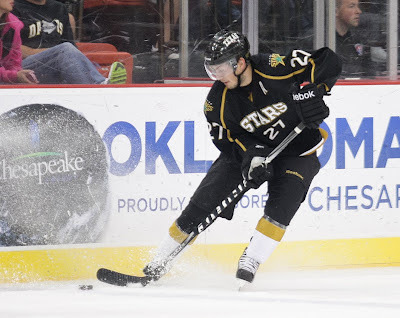 I'm sure he wouldn't admit it openly, but Hedden has to know that his five goals in the last six games are greatly enhancing his viability for another AHL contract with the Stars or another team. Finally, and this is the one you'll like, several players have said that they want to play out the season strong for the fans. The players realize that it has been a tough season for the fans, and they know that it's amazing for 6,000 plus to show up for a game after the season they've had. In this weekend's interviews, Hedden and Gazdic both commented that they wanted to have a great finish to the season "for the fans". As we wind down the last two weeks of the season, don't forget that 100 Degree Hockey doesn't go away when summer starts. There are so many things to discuss: a debrief of the season, including MVP and Most Improved Player Awards, a huge discussion of what happens with all these players next season, and keeping tracks of Stars' prospects in Canadian major junior playoffs (along with the AHL playoffs). As the season winds down, Texas got Jordie Benn back from Dallas today. Benn, who was called up as an injury to Mark Fistric took him out of the lineup, did not play in any games in this stint in the NHL. Benn will join a crowded blue line with seven defensemen already in the lineup for Texas. He will definitely play, however, likely bumping Jace Coyle or Hubert Labrie out of the lineup. I would bet on Coyle. Coach Pyle has shown a preference for Labrie's hard nosed defensive play over Coyle's more offensive but questionable defensive game. The Dallas Stars announced on Monday that the club has assigned defenseman Jordie Benn to the Texas Stars, Dallas’ primary affiliate in the American Hockey League (AHL). Benn, 24, collected one assist in his two games for Dallas this season. He became the 10th player in Dallas Stars history to record his first NHL point in his first NHL game. Along with younger brother Jamie Benn, they became the third set of brothers in Dallas Stars history and the sixth in team history to play in an NHL game together. Before men and their best friends alike could find their seats in tonight's game, the Stars were already down 2-0. By the end of the first, Texas was looking at a four goal deficit, and the air was out of the building. "You could tell how fragile we are [mentally] in this game," said Coach Pyle. Despite scoring four of their own, they still took a four goal loss, thanks to the eight spot dropped on them today by the Lake Erie Monsters. "I don't think we came out ready to play this one," said forward Mike Hedden, who had a late goal in the game. "Every time we'd get it close, they'd come down and score. Those are supposed to be statement shifts. That out there tonight was embarrassing." The embarrassment started early with Lake Erie scoring on their first two shots of the night and first two shifts of the night. Both were due to defensemen not clearing out players in front. The first goal was a tip in the high slot that a blue liner should have covered and the second was through a screen that should have been cleared out. "The first two goals were bad bounces," said Pyle. "Campbell might have been tired, but we needed to do a better job in front of him." Lake Erie struck again late in the period. Justin Mercier broke in alone and snapped one over Campbell's left shoulder for the 3-0 lead. The fourth goal came off a point shot that appeared to come out of the zone. Coach Pyle and the fans at the CPC were in agreeance on that point, but the goal stood to make it 4-0 after one. Tyler Beskorowany would replace Jack Campbell after one. Texas got on the board in the second with Colton Sceviour's 20th of the year. He accepted a deft little through the legs behind the back pass from Wathier and potted to goal as Pickard was caught swimming. Just 29 seconds later though, Lake Erie set the deficit at four once again with their fifth. Next shift letdown goals against were endemic for the Stars tonight. "The next line that goes out needs to find a way to make something happen," said Pyle. "We put ourselves in positions where you aren't going to be successful." The Stars power play came alive in the middle of the period for two quick goals. Colton Sceviour got his second of the night and 21st of the season, snapping one far side on Pickard through traffic. Travis Morin beat Pickard near side from almost the same spot on the next Texas power play to make it 5-3, a manageable deficit. Only forty seconds later though, Ryan Stoa restored the three goal lead for the Monsters to set the score at 6-3 after two. Lake Erie would tack on two more in the third period while Texas added one of their own off a turnover. Luke Gazdic would pick up a puck and Hedden collected the rebound for the 8-4 tally. With the goal, the loss officially went in the books for Tyler Beskorowany, as he allowed the game winning goal. Taylor Vause has been lost for the season with a leg injury. If the Lake Erie Monsters want to make the playoffs, they certainly didn't look like it in last night's loss to Texas. The Monsters dropped a 4-0 decision to Texas on Saturday night and now stay in town to face the Stars again today. Lake Erie now needs to play practically perfect hockey to have a chance at making the postseason. As to Texas, the Stars are mathematically eliminated from the playoffs if Lake Erie wins or takes an OT or SO loss. Because Rochester and Lake Erie play each other late in the season, someone has to get two points out of that matchup, putting them above Texas's maximum points attainable. However, the Stars season at this point is not about the playoffs. Texas is looking ahead to next year and is seeing the building blocks already developing in front of their eyes. It has become imminently clear why Jack Campbell was drafted in the first round. Campbell's solid mechanics as a big part of his game. Fans saw this on display big time last night as he had quite a few solid stops down low that he had no right making. The wrap-around in the second period comes to mind, for example. Campbell's side to side movement on the play was textbook and without it that would have been a goal. It's also clear why Austin Smith and Alex Chiasson are in Dallas's sights. Smith had quite a few tricky and talented plays last night. His pass on the Fraser goal found tape between several LE defenders and also found Fraser wide open. It takes both vision and skill to create such a scoring opportunity. Smith has both. Finally, Alex Chiasson. We have only seen him in two games so far, but his big body is clearly a huge advantage for him. He's regularly muscling guys off the puck. I think he improved from game one to game two of his career, but still needs time to get acclimated. He's had a lot of ice time in which to do that these two games, so I'm surprised the results aren't there yet.